Figure 1. BOSS operations are in place in both directions of I-40 between U.S. 15-501 in Durham County and Wade Avenue in Wake County. BOSS also continues on Wade Avenue between I-40 and Blue Ridge Road. Bus routes that operate on congested roadways are difficult to keep on schedule. When delayed, bus riders can miss a transfer to another bus, often waiting up to an hour for the next scheduled bus. Allowing bus operators to use the shoulder of certain roadways during periods of congestion can increase service reliability and the overall attractiveness of bus service for riders. Triangle Transit, NCDOT, and the I-40 Regional Partnership implemented a Bus on Shoulder System (BOSS) operation to allow authorized transit buses with trained drivers to operate on the shoulders of selected freeways at low speeds during periods of congestion in order to bypass congested traffic and maintain transit schedules. The initial pilot was extended to include a portion of I-40 that is under reconstruction (the I-40 Rebuild project) in order to reduce the number of vehicles while maintaining the number of people traveling along this portion of I-40. The Bus on Shoulder operation is a low-cost treatment that can provide immediate benefits to transit whenever travel is experiencing moderate to heavy degrees of congestion. Providing reliable and timely transit service is one way to attract and keep transit riders. Timed transfers at designated transit centers can ease the transfer process for bus riders, but only if the first bus arrives before the second bus leaves. Schedule adherence for buses operating on freeways in the Raleigh-Durham area was affected by congestion on those roadways, impacting riders’ ability to complete their trips when a bus transfer was needed. The I-40 Regional Partnership provides an ongoing focus on Interstate 40 in order to maintain and enhance its viability for travel and commerce. The Partnership is a cooperative initiative of the NC Department of Transportation (NCDOT), the Regional Transportation Alliance (RTA), and other local, regional, statewide, and federal partners. In response to the impact on bus service reliability due to congestion on portions of I-40 and at the request of Triangle Transit (TTA), in 2009, the Partnership established a subcommittee to consider a Bus on Shoulder System (BOSS). Used by several other states, BOSS allows buses to operate on the highway’s shoulders under certain conditions. The Partnership understood that attractive bus service helps reduce demand for highway travel lanes, may be the only form of regional transportation for some residents, and is part of the equation for economic livelihood of what is considered ‘Triangle’s Main Street’, I-40. Triangle Transit, which operates regional and local bus service within and the Research Triangle, joined the I-40 Regional Partnership effort to study and implement a bus on shoulder system. Working over three years, the I-40 Regional Partnership developed a bus on shoulder system as a pilot for bus service operation on I-40 southeast of Raleigh. 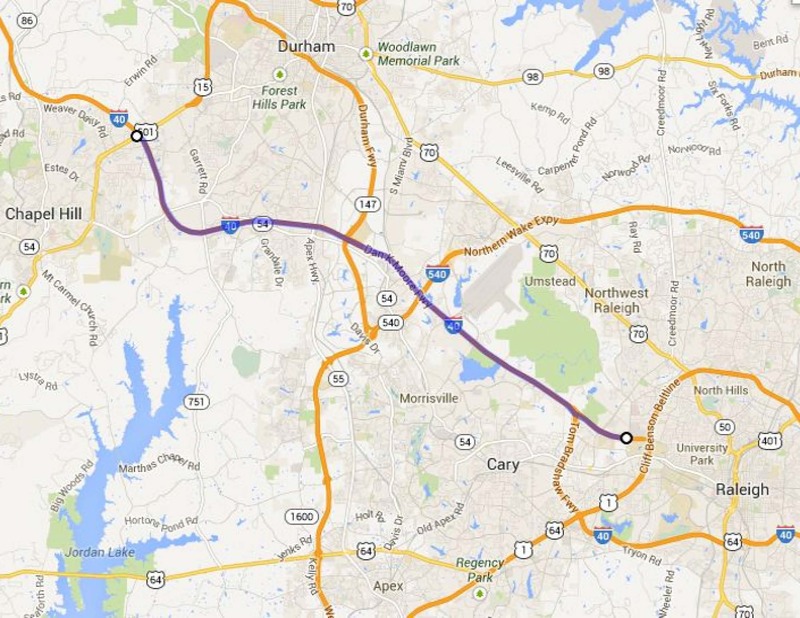 Since implementing and evaluating the pilot, BOSS has been extended to I-40 between Raleigh and Chapel Hill. Will there be enough congestion to make it worth the effort? Will the pavement structure support buses? Is the shoulder wide enough to accommodate buses? Do we need to conduct a noise study? How will we keep motorists from using the shoulder? How will we keep the shoulder clear for emergency responders? What will be done at on- and off-ramps? Can we train bus operators so that they handle the bus appropriately? Will bus riders see it as a benefit? A noise study was not needed because it did not involve adding a travel lane to the roadway. According to Mr. Whitley, shoulder use was considered temporary use and did not trigger the need for noise walls, which would have made the project unaffordable. The team learned that the available shoulder width and construction is wide enough and strong enough to support a bus and its passengers. Places where shoulders are narrow due to guard rails, bridges and overpasses are not used, nor are freeway interchanges with more than one travel lane where speeds are typically higher than single lanes. In addition to limiting the locations where bus operators can use the shoulder, travel speeds in the regular travel lanes must be 35 MPH or slower. 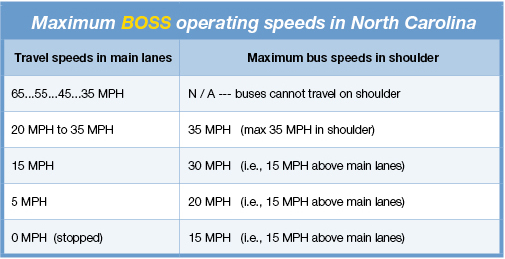 Figure 1 shows the how travel speeds on the main lanes dictate whether a bus operator can use the shoulder, and if so, how fast s/he can travel. This carefully crafted set of operating procedures used for the pilot resulted in success, allowing for the BOSS to be expanded to new routes between Raleigh and Clayton as a congestion mitigation strategy for the I-40 Rebuild Project. Training and public outreach was included in developing the Bus on Shoulder System. Transit operators trained on the operational standards, are also trained to use their judgment about whether it is safe to use the shoulder. NCDOT helped create a mock track for the initial training; then coordinate dry runs during the day when traffic volumes were very low. 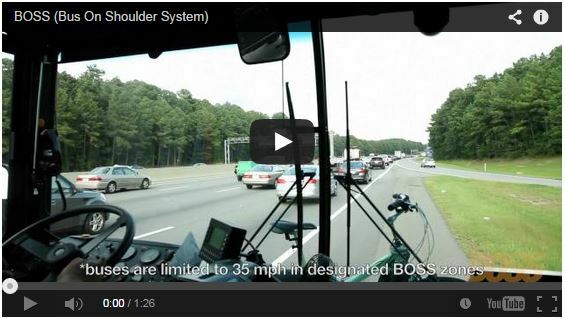 “We’ve learned that operator use varies by their comfort level; and we train our operators to have discretion about using the shoulder when congestion allows them this option.” To see what BOSS operations look like from inside the bus, watch this video. When traveling on the shoulder, bus operators are trained to look ahead for emergency vehicles or accidents. When they observe that the shoulder is in use for these (or other purposes), operators return to the regular travel lanes. This stipulation eased concerns by emergency responders. Finally, NCDOT’s Service Patrol is on alert to keep the shoulders clear of abandoned vehicles and debris. So, on any given day, the shoulders are in better conditions for emergency vehicles. Based on its research and planning, the BOSS subcommittee developed an Implementation and Operations Plan (IOP). The IOP, submitted to FHWA’s Division Administrator, provided the basis for approval to move forward with the pilot. The project cost was low in comparison to the benefits. NCDOT spent $30,000 and $40,000 primarily for signage. Triangle Transit paid for bus operator training. The trainer was involved in the project development. Triangle Transit analyzed on-time performance during the pilot and the benefit to its customers riding on affected buses. According to John Tallmadge’s assessment of the pilot: While this Pilot Project produced limited data by which we can quantify the benefits of the Bus on Shoulder System, it did demonstrate the potential for improving the reliability of bus services in making connections and maintaining a schedule. In corridors where congestion and traffic delays are more chronic, the benefits of BOSS would be substantial for the reliability of bus operations and in reducing travel delay for customers of the bus services. Further, BOSS is being used as a strategy to attract and retain bus riders. According to John Tallmadge, anecdotal information suggests that bus riders feel they are getting something extra when riding on buses that operate on the shoulder, passing the congestion. BOSS operations are also being used as a congestion mitigation strategy for the I-40 Rebuild Project, moving more commuters through the work zone in fewer vehicles. Both NCDOT and Triangle Transit hopes bus service will continue after the re-build and that BOSS operations will continue to be an option for service reliability. As a secondary benefit, NCDOT has made an effort to keep the shoulders clear of abandoned vehicles and debris. So, on any given day, the shoulders are in better conditions for emergency vehicles. Use service patrol to do this. This Bus on Shoulder System (BOSS) Pilot Project was initiated on July 17, 2012 on the most congested area of I-40: the stretch of I-40 between Page Road (Exit 282) and US 15-501 (Exit 270). Triangle Transit operates four routes that use portions, or all, of this section of interstate for 105 trips per day. These routes are CRX, 800, 700, and 42. This segment of I-40 was selected for the Pilot because of the ease of implementation. A secondary consideration for shoulder operations was transit benefits for riders and bus service efficiency. TTA’s analysis of the transit benefits BOSS suggests the benefits are substantial enough to warrant continued and expanded use. Meredith McDiarmid wants to make BOSS operations sustainable in other areas across the state. John Tallmadge is developing its application for arterials with shoulders, and is working with NCDOT on criteria for doing so. From the transit perspective, ridership retention remains a goal for BOSS operations, along with operational efficiencies. Perhaps the most important lesson learned from the process used to ‘build’ the bus on shoulder system is that about partnering and collaboration. Many stakeholders participated in developing BOSS operations, systematically identifying and resolving issues through discussions, research, and reaching out. The pride expressed by those helping prepare this case study makes this clear. Triangle Transit Bus on Shoulder System http://www.triangletransit.org/bus-shoulder-system. NCDOT Bus on Shoulder System http://www.ncdot.gov/nctransit/boss/. Regional Transportation Alliance http://www.letsgetmoving.org/ . I-40 Regional Partnership Initiative http://www.letsgetmoving.org/priorities/i-40-regional-partnership-initiative/ .